When Shelley was in the 7th grade, she invited Jesus to come into her heart as her personal Savior. Since then she has truly made Jesus Christ, the Lord and Master of her life. Soon after her conversion, she joined a Christian youth singing group called Carpenter's Tools International, traveling as far as Australia to share the Gospel. She later became the youngest member of an adult Minnesota Christian Chorus which traveled and ministered to a variety of both secular and Christian events, from car racing to church services. As an adult, Shelley has been blessed to have served in her church as a Worship Leader for both adults and youth. 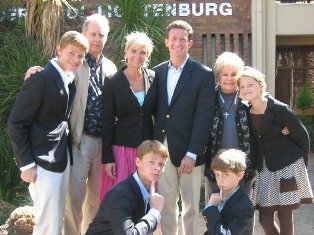 This past August, 2010, Shelley, Herb and their young musical family of six traveled to South Africa on a mission trip with grandparents, Bob and Ann Kuefner. Shelley and Herb led in singing while 16 yr old twins Jordan and Luke played the saxophone and trombone, Abby (12 yr old) played the flute and saxophone and 11 year old Andrew played the trumpet. We have been told, this may be the first all-family band to minister throughout South Africa. With much joy in the Lord, they shared the Good News of Jesus through their music and personal testimonies resulting in many precious lives being won for the Lord. One afternoon a few years ago, God spoke to Shelley's heart and she sat down at her piano and wrote this song, "Work of Art." May it bless each listener, speaking to each heart as a remarkable reminder of God's incredible love for you and how you too are a precious "Work of Art."